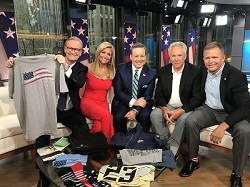 NASHVILLE, Oct. 16, 2018 /Christian Newswire/ -- During a recent appearance on Fox & Friends, Army veteran and businessman Dean Wegner, founder of Authentically American®, described his company's brand as one that "celebrates patriotism" by offering merchandise that is exclusively "Made in USA" (High-resolution version of photo available on request). The segment also noted that Authentically American honors US heroes by donating 10% of its revenue to charities that support veterans, first responders and their families. "With our family, when we're talking with the kids and someone comes in, what do we ask them to do? We ask them to stand and shake hands and look them in the eye. It's a sign of respect. [In the] military, when a commanding officer…your superior walks in, you stand up. It's not about what anyone else is doing, it's about the choices we are making." Wegner has since received numerous calls, texts, emails, and posts on social media about his comments, including a note from a former West Point classmate who described them as the "best answer I have heard yet to the kneeling controversy." Founded in 2017 and based in Nashville, Tenn., Authentically American is a veteran-owned company that sells premium, competitively priced consumer and organization-branded apparel and hard-good "Made in USA" products. Its mission is to help create US jobs by supporting American manufacturing. The company's investment team includes TV broadcaster and NASCAR legend Darrell Waltrip, who appeared with Wegner on the Fox & Friends segment. Wegner described Waltrip as "a man of faith," whose character and integrity align with the values Authentically American seeks in its leadership and investors. Wegner said he is guided by values derived from the foundation of his Christian faith and steadfast patriotism, noting, "We hold our owners, investors and work family to the highest level of integrity." Authentically American's customers range from Fortune 500 companies and nonprofits to small businesses. The common thread is their support for "Made in USA" merchandise and American manufacturing. Wegner said he aims to build an iconic American brand that is truly American made and sets the standard for "Made in USA" merchandise, offering a positive way for people to show their support for the nation, its workers and American heroes. While organizationally branded merchandise for businesses, political campaigns, schools, nonprofits, sports, etc., comprises the largest part of Authentically American's sales, individuals also can make purchases of American-branded apparel through the company's online store at www.authenticallyamerican.us/branded. For more information visit www.authenticallyamerican.us. To view the Fox & Friends segment go to video.foxnews.com/v/5833963047001/?#sp=show-clips.